DJ P-Cutta,” aka Preston Quartey, mixtape artist, deejay and principal owner of Rooftop Entertainment, has been touted as a major player in the un- derground mixtape industry. Street Wars, P-Cutta’s innovative compi- lation of Hip Hop’s battles and beef, has been called “the hottest mixtape on New York’s streets…a blow-by-blow of the industry’s current beefs” (E. Brown, New Yorker Magazine Dec. 1, 2003). After five years of being the “go to guy” on what was hot and where to find it, P-Cutta decided to produce a mixtape that would combine his love of hip-hop music and MC battling. In Oct. of 2001,he released “P-Cutta Presents: Street Wars”, an innovative compilation of hip-hop’s battles and beef. The only mixtape with this concept, Street Wars quickly became the most respected source for the industry’s hottest beefs. In less than a year, Street Wars became one of the most popular and widely distributed mixtapes throughout the US. and international markets, such as Canada, England, Germany and Tokyo. By music industry standard’s, P-Cutta’s Street Wars Vol. 1 earned gold record status. In an underground industry where only true hustlers survive, in fewer than three years, DJ P-Cutta and Rooftop Entertainment have become one of the most recognized sources for mixtape flava in the country. Since stepping onto the court in 2001, he has produced hundreds of projects, garnering numerous features and honorable mentions in television, radio and print media. 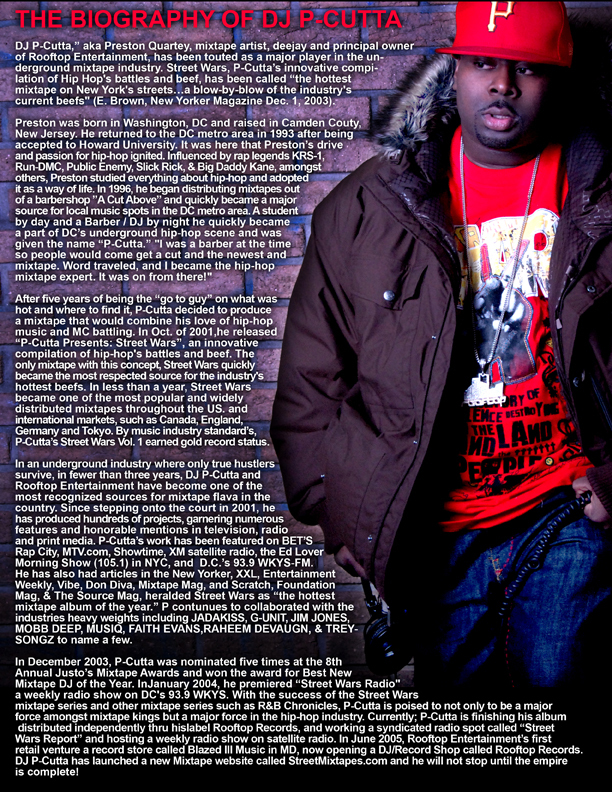 P-Cutta’s work has been featured on BET’S Rap City, MTV.com, Showtime, XM satellite radio, the Ed Lover Morning Show (105.1) in NYC, and D.C.’s 93.9 WKYS-FM. He has also had articles in the New Yorker, XXL, Entertainment Weekly, Vibe, Don Diva, Mixtape Mag, and Scratch, Foundation Mag, & The Source Mag, heralded Street Wars as “the hottest mixtape album of the year.” P contunues to collaborated with the industries heavy weights including JADAKISS, G-UNIT, JIM JONES, MOBB DEEP, MUSIQ, FAITH EVANS,RAHEEM DEVAUGN, & TREY- SONGZ to name a few. In December 2003, P-Cutta was nominated five times at the 8th Annual Justo’s Mixtape Awards and won the award for Best New Mixtape DJ of the Year. InJanuary 2004, he premiered “Street Wars Radio” a weekly radio show on DC’s 93.9 WKYS. With the success of the Street Wars mixtape series and other mixtape series such as R&B Chronicles, P-Cutta is poised to not only to be a major force amongst mixtape kings but a major force in the hip-hop industry. Currently; P-Cutta is finishing his album distributed independently thru hislabel Rooftop Records, and working a syndicated radio spot called “Street Wars Report” and hosting a weekly radio show on satellite radio. In June 2005, Rooftop Entertainment’s first retail venture a record store called Blazed III Music in MD, now opening a DJ/Record Shop called Rooftop Records. DJ P-Cutta has launched a new Mixtape website called StreetMixtapes.com and he will not stop until the empire is complete! Peace I wanted to get some info on wholesale.